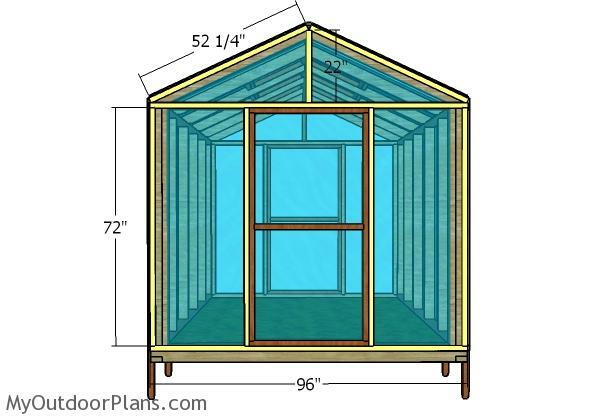 This step by step diy project is about 8×10 greenhouse doors, vents and trims plans. This is PART 2 of the greenhouse project, where I show you how to build the vents, the doors and the trims for the greenhouse. 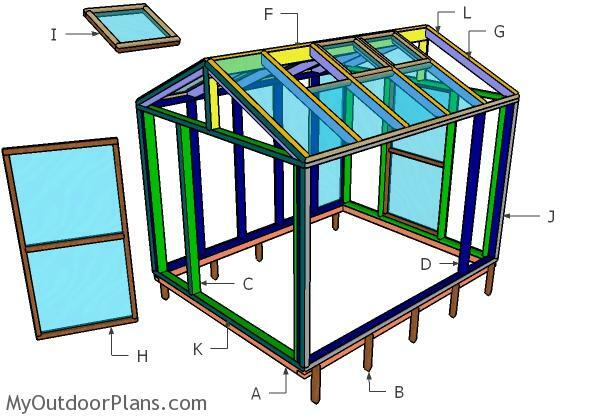 In addition, I show you how to fit the 1×2 trims to the exterior of the greenhouse, so you can lock the greenhouse plastic into place. Take a look over the rest of my woodworking plans, if you want to get more building inspiration. The first step of the project is to frame the vent openings to the roof. Cut the 2×2 supports at 22 1/2″ screws and drill pocket holes at both ends. 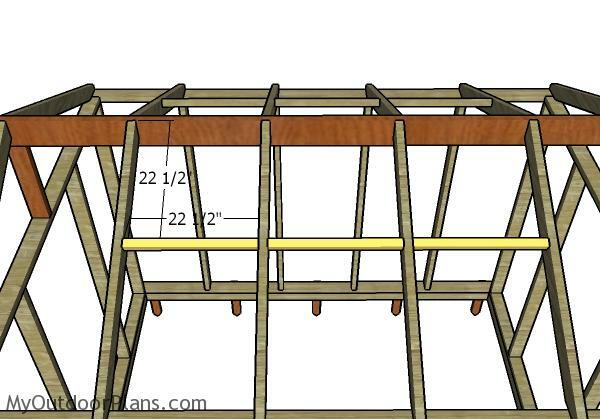 Fit the supports to the roof rafters and then insert 2 1/2″ screws to lock them into place tightly. Make sure you align the edges and check if the corners are square. 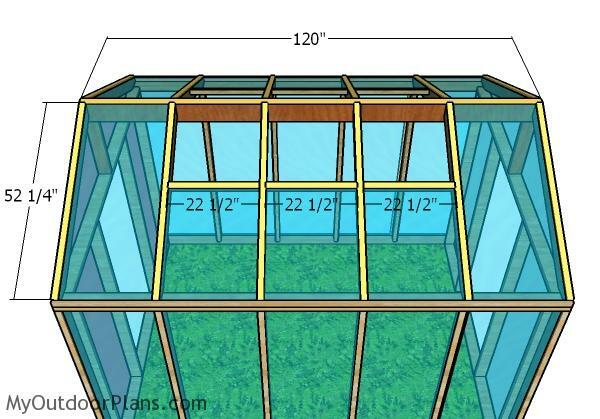 Fit the greenhouse plastic to the greenhouse and stretch it properly. 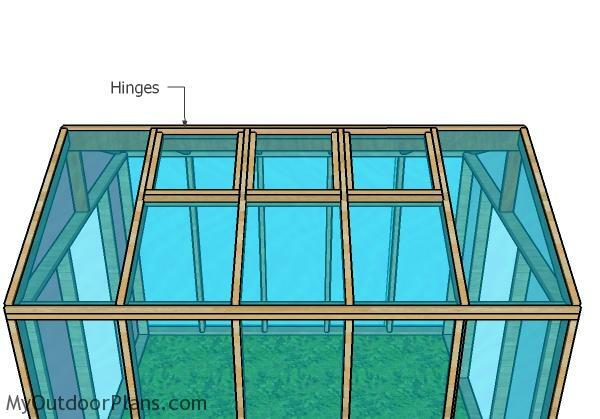 Continue the project by attaching the 1×2 trims to the side walls of the greenhouse. Align the edges flush and use 1 5/8″ screws to lock the trims into place tightly. Next, fit the trims to the roof of the greenhouse. Use screws to secure the trims into place, so you can remove them easily when replacing the film. Fit the 1×2 trims to the front of the greenhouse. Cut the trims at the right dimensions and then secure them into place with 1 5/8″ screws. You need to predrill the trims before inserting the screws, for a professional result. Build the door frame from 2×2 lumber. As you can easily see in the diagram, you need to drill pilot holes before inserting the 2 1/2″ screws. Align the edges flush and make sure the corners are square. Fit greenhouse plastic to the door frames and then attach the 1×2 trims. Align the edges flush, otherwise they won’t fit into place. Fit the doors to the front and back opening and then lock them to the jambs with hinges. Install a latch so you look the door. Install handles, as well, for a professional result. 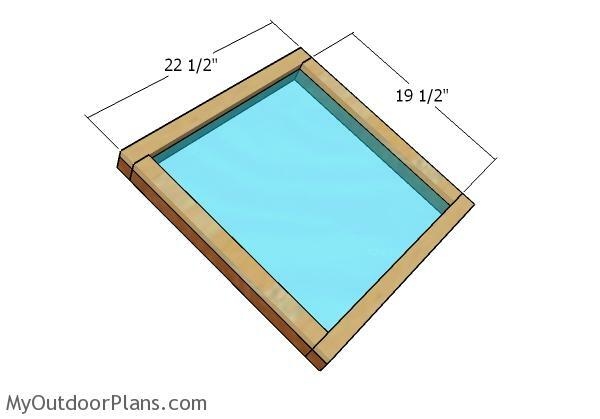 Build the vents for the greenhouse from 2×2 lumber. Drill pilot holes through the 22 1/2″ long components and insert 2 1/2″ screws into the perpendicular components. Make sure the corners are square and align the edges flush. Fit greenhouse plastic of polycarbonate to the frame of the vents. Afterwards, attach the 1×2 trims so you can lock them together tightly. Fit the vents to the opening and lock them into place tightly with hinges. Alternatively, you can install automatic vent openers, so you can control the temperature inside the greenhouse. You need to take care of the finishing touches before using the greenhouse. Therefore, double check the joints and make sure the structure is sturdy. 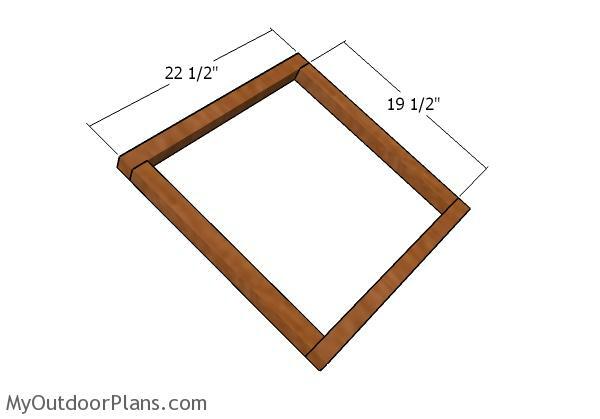 You can even fit some diagonal braces to enhance the frame sturdiness. Smooth the edges with sandpaper and then apply a few costs of paint, making sure you choose a product that is not harmful to the plants. 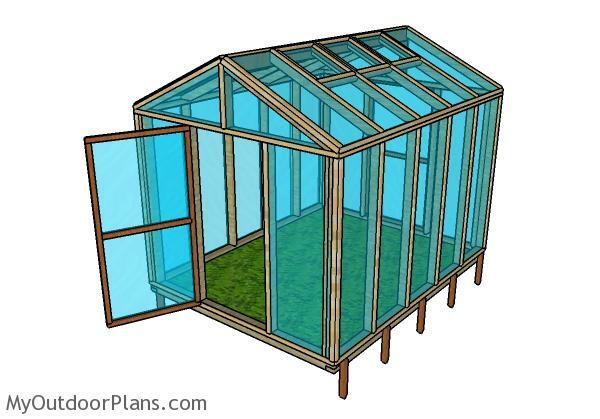 This is a straight forward project, so you can build this greenhouse in less than 1 week. 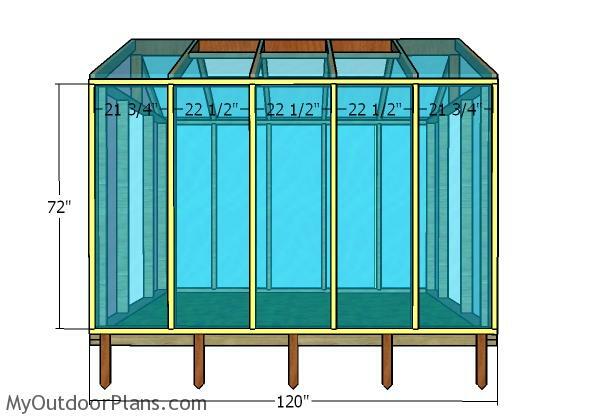 Don’t forget to take a look over PART 1 of the woodworking project to learn how to build the frame for this greenhouse. 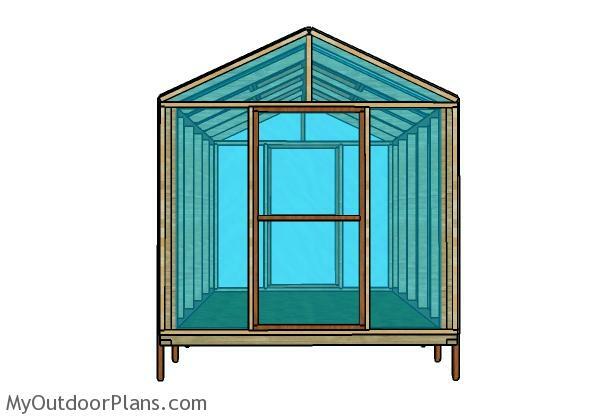 In addition, see a lot more greenhouse plans HERE. 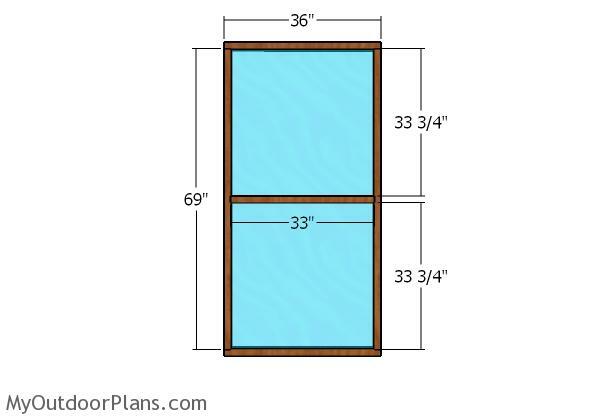 This woodworking project was about 8×10 greenhouse door and trims plans. If you want to see more outdoor plans, check out the rest of our step by step projects and follow the instructions to obtain a professional result. Thank you for your easy plans . Now I can builder myself.